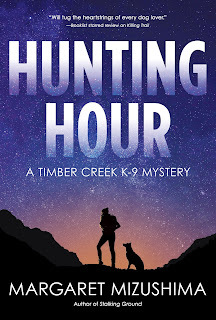 Margaret Mizushima is pleased to announce the release of HUNTING HOUR, third in the Timber Creek K-9 Mystery series, on August 8, 2017. Deputy Mattie Cobb and her K-9 partner Robo find a missing junior high student dead, but before they can catch the killer, another child disappears—and this time it’s one of Cole Walker’s daughters. Mattie and Robo must lead the hunt to capture a kidnapper before they’re too late. HUNTING HOUR can be found at bookstores and online booksellers.